It’s 3AM and the sound of metal colliding wakes you. There’s been an accident; a drunk driver it turns out. When you peek your head out the front window you see two cars have crashed head first and one has ricocheted off your historic oak tree. You simultaneously call the police while attempting to do a cursory inspection. Fortunately, everyone involved will survive. In the early morning light you detect significant damage to the oak that has stood strong for over one hundred years. Your next call is to Savannah Tree Service because you know that our dedicated and passionate arborists have the knowledge and skill to save your family’s tree. We are conveniently located in Savannah, GA allowing us the opportunity to reach you within a matter of minutes. Our staff is on stand-by and waiting for your call - even at three in the morning. Human life can be put in jeopardy from the result of hanging power lines brought down by a heavy tree limb. 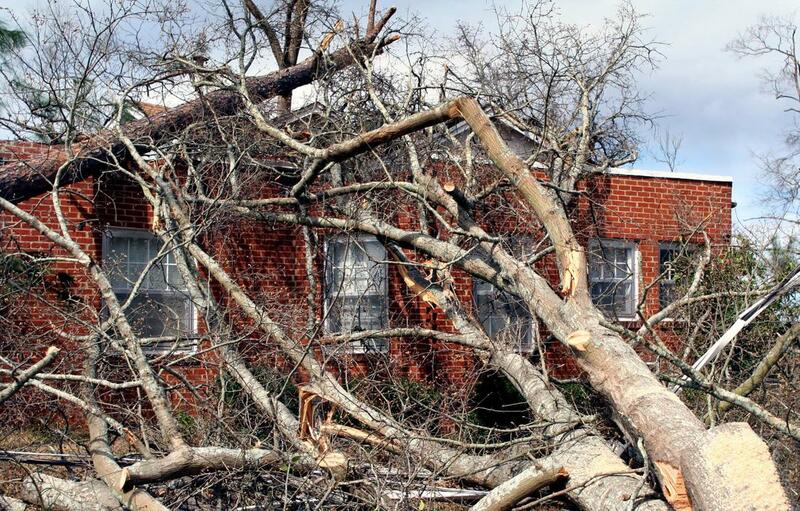 If a large tree is impacted at high speeds by a large vehicle, it may shift the tree toward your home, leaving your roof and windows at risk of collapsing or breaking. Once we receive the call we come prepared to cut any necessary limbs or remove any trees and surrounding shrubbery. If a heavy vehicle collides with a tree on your property, that tree may be damaged beyond repair. If so, it will need to be removed promptly. If not, you will risk it falling on valuable property and causing further damage. Our arborists would prefer to repair your tree rather than remove it. Like a human being undergoing a major surgery, we will examine the damage, make an assessment and devise a plan to get the tree back to health. The sooner we act, the better chance your tree has at surviving the collision. There are a variety of treatments available for sick trees. Cutting around the wound of the tree would be our first tactic. Once we remove the dead and injured bark from the wound, the healing process will accelerate. Insects like to germinate under dead bark. Insects working feverishly, will murder your tree over time. We would also remove any smaller, less valuable vegetation from around the injured tree. The goal is to remove any other living entities that may be competing for resources. A simple yet effective strategy involves removing all dead leaves, branches and bark from around the sick tree. Harmful bacteria breed in dead plant matter and we want to minimize all unhealthy bacteria. It’s a sad day when we have to remove a tree that has stood strong for over a century. In times like these we take the opportunity to teach children about tree their life cycles by letting them count the rings. Removing a tree is not an all day process. We will use intelligent forestry equipment to grip and rip the entire tree and its root system from where it stands. Following the removal, our team will slice then grind the stump. If you’d like to keep a portion of the trunk to be stained and treated as a table or ottoman, our staff can make that possible.